Stage 1- Last year Stage One consisted of a nine mile prologue, but this year it was replaced by something slightly longer... 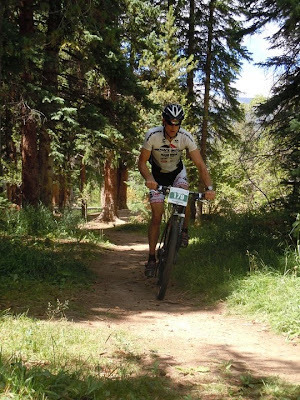 In fact, they dubbed it "Queen Stage-worthy": 41 miles, 6100' of climbing... all above 10,000 feet. 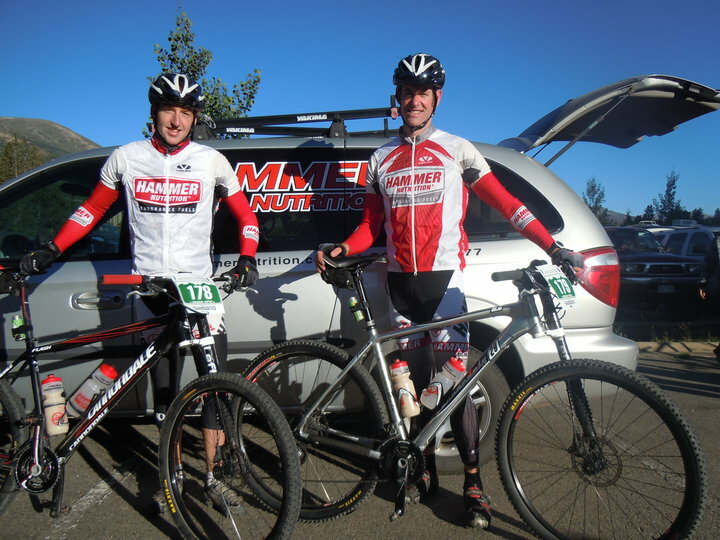 And so it begins, Day 1 done and smiles are all around at Team Hammer/Sportsman. In a true ADD/impulsive style, we decided to throw our chips into 1 pot and shoot for the podium in the Open Men's Duo. Not knowing much about our competition, we decided to just gun for the boys we normally duke it out with, but not go too deep knowing that the elevation and 6 days of marathon style mountain bike racing will compound exponentially. At the start line Mike McCormick, the race promoter/organizer, sent us off with a good vibe as we all rolled up the road waiting for Bishop to begin the "stab 'n twist" torture the rest of us would expect. The race went well, as we were greated with over 95% of pure satisfaction singy, 1% tear your body and sidewall apart road/trail, and a the rest smooth road so you could actually take a moment to take a swig of heed, pound some endurolytes, and gulp a glop of gel. Steve Born at Hammer gave us a great hourly schedule of fueling and supplementing, with 1 bottle/hour heed and perpetuem, 2 caps each of endurance aminos, antifatigues, and endurolytes galore. We both felt incredible the entire length of the stage with no lows, although we made it a point to ride conservatively and stay out of the red zone due to the lack of oxygen. Towards the end, the legs starting feeling the effects of all the high-ele climbing, but we pounded a few more endurolytes and felt great all the way to the line. We were paced excellent throughout the entire race, and continually moved up through the pack as we kept our pace to an uncomfortable but sustainable level. Our only mishaps were a few stops for a slipping seat post and a dropped chain. We are both really excited after taking roughly 15 minutes out of the next men's duo team (we think), and finishing somewhere in the top 20 overall. It is a super stacked line up here and we just want to race a smooth, smart, and bonk/mechanical free race. We both are feeling like our best bet is to just gradually turn up the dial every day as we get used to the altitude and find our enduro legs. We'll keep you posted! Tomorrow entails 45 miles and 7300' of climbing, so we're going to do a little cold water soaking, globus sessioning, and leg elevating.